• Clinical and business process leaders need to own the EHR and other technologies, and while ownership is shifting, it's doing so "painfully." • IT and information management competencies are not up to the task, so staffwide training is required. • HIM professionals are working in more "embedded" roles throughout health care organizations. • HIM is working more closely with clinical teams to improve EHR documentation. • The HIM managerial role is shifting from supervising departments to managing HIM knowledge workers. • Information management must be viewed as an enterprisewide set of functions. • Plan how ICD-10 will be used and look ahead to broader use of clinical vocabularies and other classification systems. "These 2011 observations were identified by HIM leaders who were living these challenges day by day," says Kloss, adding that it's been a tumultuous five years for HIM—and most other health professions. "I expect that if the same people were in the room today, they would conclude that they have gained ground, but that these observations remain highly relevant. I expect that they would add a few more to this list. They might add that the impact of health system mergers and acquisitions occupies a good deal of managerial time and is driving many of the decisions being made about information management and information policy. "I expect they would also cite the challenges of doing more with less and dealing with more complex issues that have greater urgency. For example, HIM restructuring has reduced the number of HIM professionals at the managerial level at the same time when the complexities of the managerial issues have increased. In this environment, it is necessary to optimize efficiency and workflow with technology, stop doing 'business as usual,' and work collaboratively at all levels," Kloss says. Four scenarios for HIM services in 2016 were developed based on two parameters expected to have the greatest impact on how HIM evolves: The extent and optimization of adoption of information/communications technology and the state of improvements in health system performance. The parameters range from implemented to optimized and marginal to superior, creating scenarios in which technology is implemented but not optimized, and improvements in health system performance are marginal; improvements in performance are superior, but technology is not optimized; technology is optimized, but improvements in performance remain marginal; or technology is optimized, and improvements in performance are superior. "The value of scenarios is in their consideration of more than one future state as bounded by important external drivers. In fact, there is never just one future state; there is always a range depending on how the important variables play out," says Kloss, who believes that all four of the scenarios are very much in evidence and effectively describe HIM today. "As we know, each health care organization has acquired and adopted information technology at its own pace and in keeping with its priorities and needs. "Meaningful use and other external measures of adoption aside, there has been a wide range of technology optimization. HIM services redesign began earlier at some health systems than at others, often driven by technology capabilities such as those supporting remote work or permitting computer-assisted workflow. Digital information has required new information functions such as greater focus on data quality and data and information governance." Additionally, Kloss says, "health reform, including care delivery redesign, payment changes, and expanded access to health care, has also impacted the shape and speed with which HIM services have evolved. Accountable care has accelerated the need to link a patient's information across time and care settings. 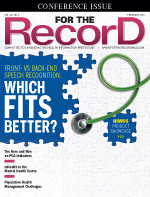 Health financing changes have increased focus on documentation and complete coding." To advance HIM capabilities and functions to the scenario in which technology is optimized and improvements in health system performance are superior, the paper recommended that organizations improve change management leadership, strengthen the policy framework for information management, reduce technology and information silos, use clinical analytics to support overall quality and cost of care and to improve system performance for high-risk populations, advance the skills and professionalism of all information management positions, collaborate more extensively with clinical leaders, develop policies for longitudinal records management, expand resources to support data capture and clinical documentation, offer basic information management training for everyone that contributes to the EHR, and hit a home run with the transition to ICD-10. How well the profession has used these strategies varies. "With respect to the ICD-10 transition, the profession wins top marks for persistence and for leading a transition to a very successful and soft landing," Kloss says. "The profession has embraced the need for more robust information and data governance and the attendant improvements in information policy and process. Done well, managing and governing information resources across a health care enterprise must be the role of HIM in a digital environment, but it is a role to be earned, not grandfathered." Considering tighter resources and greater complexity, Kloss says that "leadership skills, project management expertise, managing an enterprise-level function, and teamwork and collaboration skills have never been more key to professional success." According to Kloss, the pace of change for HIM has sped up as IT has become more integrated and is likely to accelerate as the use of health information becomes ubiquitous. "It would be useful to consider scenarios for 2020 or 2022," she notes. "In many ways, the last five years have been a time of building information and information management capability." Now that we've reached 2016, what will the HIM department look like five years from now? Fully answering this question, Kloss says, would require beginning a new scenario planning exercise, reexamining the changing environment, and identifying key trends and likely drivers for HIM change. "For example," she says, "will a driver continue to be adoption and optimization of technology or will it shift to a focus on use of the information that is the product of the technology? I expect in the years ahead it will be the value of health information to a growing range of stakeholders, with patients front and center, that will determine how HIM must continue to evolve. I also expect that changes in value-based health care financing and payment will be a key driver for evolving HIM. What will ICD-10 contribute to payment modeling and will use of vocabularies and terminologies finally come of age?" While the future isn't certain, it's easy to predict that it will include change, which HIM professionals should proactively explore and embrace. Kloss expects nothing less. "The HIM profession has done a great job over nearly a century of adapting to changing needs," she says. — Heather Hogstrom is an editorial assistant at For The Record.